This is the first blog of the new site for Allred's Outback and More. 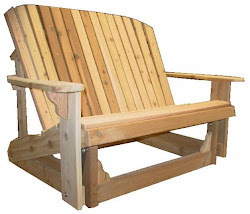 We sell Adirondack-style outdoor furniture and other items related to enjoying life "outback": in your yard, your garden, and just anywhere outside. Here in Arizona, we love being outside all year except for those hot summer months of June thru September. The wood we use in our many great outdoor furniture products won't get hot like the metal chairs you find in the Big Box stores.